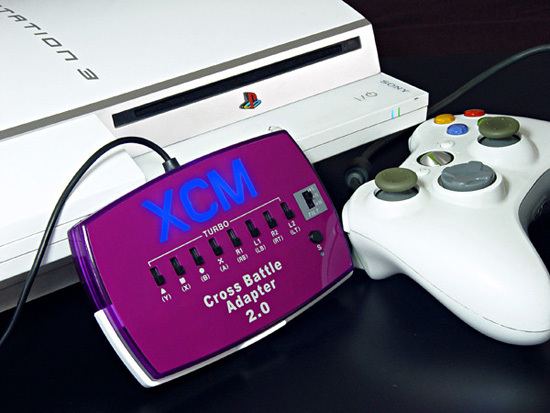 Accessories : Cross Battle Adapter 2 for PS3 - SHOP01MEDIA - console accessories and mods, retro, shop - One Stop Shop! The Cross battle adapter 2.0 is an adapter that allows you to connect your Xbox 360 wired controller to your PS3 console for use with PS3 games.The Cross battle adapter 2.0 is an adapter that allows you to connect your Xbox 360 wired controller to your PS3 console for use with PS3 games.Cross Battle Adapter 2 working with all PS3 firmwares, sometimes you need to update its firmware. >> Cross Battle Adapter 2 firmaware uppdate. 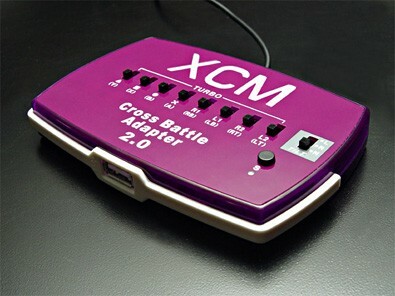 The XCM Cross Battle Adapter 2.0 is built with a new function for swapping the controller’s triggers and bumpers. You can also swap the functions of A,B,X,Y buttons (Example: Set the function of A button to the X button or set the function of B button to the Y button, etc) and swap the functions of 2 analog sticks as well! The PS3 Six Axis mode is also supported. The best adapter in the industry just got better!